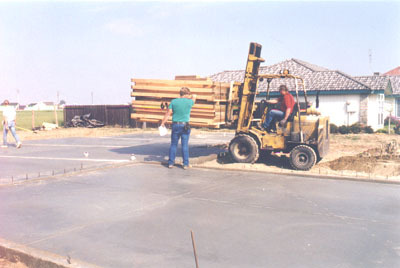 PLEASE NOTE: The following pictures are typical of the construction sequence of one of our packages on a concrete slab foundation. 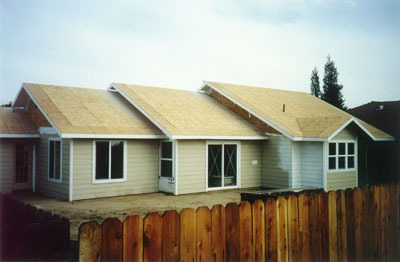 We also provide packages for raised foundations. We have even designed a package for use as a house boat.....the foundation was a barge! 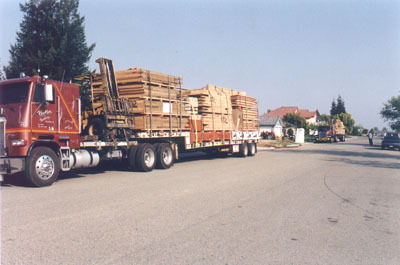 The package arrives on two flat bed trailers. 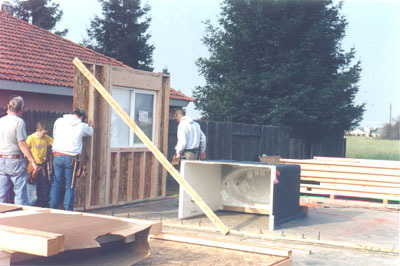 All walls are bundled in the order they will be needed. 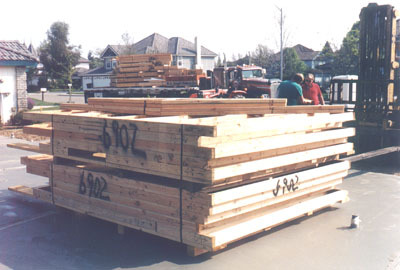 On this job, the forklift was able to place some of the bundles on the slab foundation. 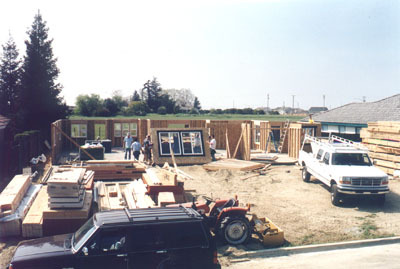 In a matter of a few minutes, the first walls are standing. With only 4 men (1 carpenter, 1 carpenter apprentice, 2 laborers), the standing of the wall panels progresses easily. 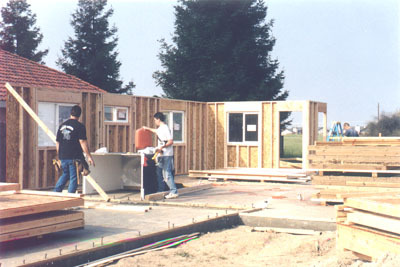 By the end of the first day, most interior and exterior wall panels are stood. 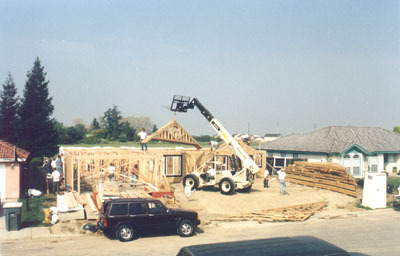 After the wall panels have been plumbed and aligned, the roof trusses are ready to be placed on top of the wall panels. 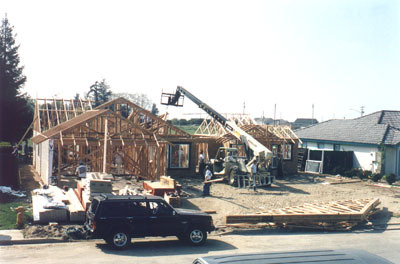 Just like the wall panels, the roof trusses are easily erected per the roof framing plan, roof truss engineering, and instructions provided by PMHI. 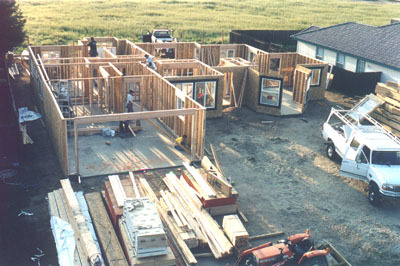 Most packages are ready for framing inspection in a matter of days. 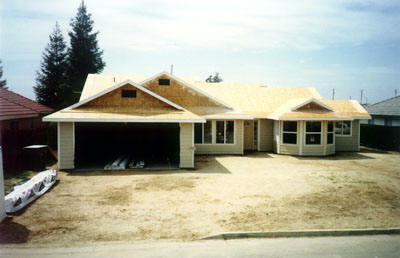 After the local framing inspection, you are ready for the finish material deliveries or sub-contractors. PLEASE...... let us know if you have any questions about the construction of our packages or how our vast experience would help you from site planning through project completion.......any place in the world.